Birds, fish, and other wildlife have been showing up dead by the thousands around the world. Some officials have been baffled by the mysterious deaths, while others have claimed that these deaths are natural and happen regularly. Birds, fish, and other wildlife have been showing up dead by the thousands around the world. Some officials have been baffled by the mysterious deaths, while others have claimed that these deaths are natural and happen regularly. Tests have been done on the animals and their environments to determine if disease or toxins played a role, but none have been discovered so far. Stress, weather, and clumsiness have all been offered by experts to explain the strange deaths, but there does not seem to be any definitive answer in any of the cases. So what is the real cause of so many mysterious animal deaths? Some have speculated that contact with cloaked UFOs could be responsible for some of the deaths, but without any firm evidence, the true answer may never be known. 4,000-5,000 dead red-winged blackbirds scattered the ground in Beebe, Arkansas on New Year’s Eve. Initial tests have concluded that the birds suffered physical trauma including internal bleeding. Explanations have included weather, fireworks, and UFOs. Some experts have settled on the explanation of “loud noises” as the cause of death. 500 dead birds, including red-winged blackbirds and starlings, were discovered on January 3rd, as their dead bodies littered a quarter-mile stretch of highway in Point Coupee Parish. Biologists have said that initial tests show the birds suffered internal injuries that formed deadly blood clots. Hundreds of snapper washed ashore on beaches in New Zealand on January 4th. The matter is being investigated. More than 40,000 Velvet swimming crabs washed up on beaches along the Kent coast on January 4th. Whelks, sponges and anemones were also found among the crabs. Their death is being blamed on cold weather. 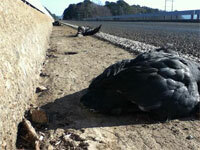 Hundreds of dead mud-hen birds appeared on a Highway 155 bridge at Lake O’ the Pines on January 5th. According to the Texas Parks and Wildlife Department, dead birds on this bridge is a “natural occurrence,” though not usually so many birds at once. 50 dead jackdaw birds were found on a street in Sweden on January 5th. CNN has reported that autopsy results show the birds died of “severe internal bleedings caused by external blows.” Fireworks were also offered as an explanation though, as they were reportedly set off in the area on Tuesday night. On January 5th, more than 2,000,000 fish were found dead in the Chesapeake Bay, primarily consisting of adult spot and juvenile croaker fish. Water quality tests show the water to be at acceptable levels. Biologists suspect that “cold water stress” killed the fish. 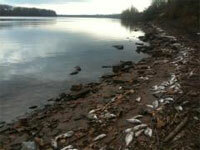 A survey has concluded that at least 100 tons of dead fish, including sardine, croaker and catfish, have washed ashore in Parana since December 30th. Authorities suspect an “environmental imbalance” as the cause of death. Verry odd indeed. Is this proof that we have irreversibly damaged ecosystems world wide? Perhaps there are much more powerfull forces at work here. No i dont mean a magical bearded man in the sky. There are also bird/fish deaths in Canada and Argentina. Internal bleeding from severe external blows has nothing to do with the environment!! “Aliens” are here! What we witnessing, is just beginning and the top of the Iceberg! Magical Global Warming has nothing to do with it. Let the people know! respect Free Will. Disclosure movement. This is some bizarre/strange events indeed. Let’s just hope there are no “Aliens” involved cause, let’s face it, what happens when a more intelligent life-form meets a less intelligent one? If our own history could shed some light on what would happen, it would likely mean we would be exterminated to the point we no longer posed any threat to our “invaders”, so let’s hope it’s just some weird natural phenomena! Seems to me the “internal bleeding” and “external blows” only refers to the dead birds, thus bringing up the idea that they died upon impact to the ground. But what caused the birds to seize mid-air? This is the real question at hand. The photo of Parana, Brazil puzzled me. If the water has been tested and their are no chemical occurrences, (and I’m sure the cold weather does not play a part in this instance), then what other enemy can we assume? Underwater explosives? Radiation? And are there no witnesses to at least the birds falling from the sky?? what about HAARP?? with those extremely low frequency waves that only animals are able to detect?? ?